Bull bars from hubcap-tire-wheel.com give you solid steel protection for your truck. Preventing dents and dings has never been easier with our high-quality bull bars. Also known as grille savers, will also help protect your vehicle from animals out in the rural areas on the highways. It doesn't matter if you're searching for stainless black powder-coated bull bars or steel bull bars, Hubcap, Tire & Wheel features bull bars in various styles and finishes so you can easily find what you're looking for to put on your badass truck or SUV. Bull bars are an easy install as well. We always recommend professional installation but this is one of those items you can easily tackle for added protection and is great for aesthetics. If you have any questions at all, please feel free to give us a call at 800-232-0734 or use the contact us button located at the top of every page. 1999-2006 Chevrolet Silverado 1500 Bull Bar - Black Smittybilt (51011). Black Bull Bar (51011) by Smittybilt. Add protection and rugged styling to the front of your rig with this easy to install Bull Bar. Crafted from thick 3" tubular steel, it includes a heavy-duty skid plate and it's drilled for off-road lights up to 5". The Bull Bar is available in your choice of carbon steel with dual stage high-gloss black powdercoated finish or highly polished 304 marine-grade stainless steel. 1999-2006 GMC Sierra 1500 Bull Bar - Black Smittybilt (51011). Black Bull Bar (51011) by Smittybilt. Add protection and rugged styling to the front of your rig with this easy to install Bull Bar. Crafted from thick 3" tubular steel, it includes a heavy-duty skid plate and it's drilled for off-road lights up to 5". The Bull Bar is available in your choice of carbon steel with dual stage high-gloss black powdercoated finish or highly polished 304 marine-grade stainless steel. 2002-2006 Chevrolet Avalanche Bull Bar - Black Smittybilt (51011). Black Bull Bar (51011) by Smittybilt. Add protection and rugged styling to the front of your rig with this easy to install Bull Bar. Crafted from thick 3" tubular steel, it includes a heavy-duty skid plate and it's drilled for off-road lights up to 5". The Bull Bar is available in your choice of carbon steel with dual stage high-gloss black powdercoated finish or highly polished 304 marine-grade stainless steel. 2002-2006 Chevrolet Suburban 1500 Bull Bar - Black Smittybilt (51011). Black Bull Bar (51011) by Smittybilt. Add protection and rugged styling to the front of your rig with this easy to install Bull Bar. Crafted from thick 3" tubular steel, it includes a heavy-duty skid plate and it's drilled for off-road lights up to 5". The Bull Bar is available in your choice of carbon steel with dual stage high-gloss black powdercoated finish or highly polished 304 marine-grade stainless steel. 2002-2006 GMC Yukon XL Bull Bar - Black Smittybilt (51011). Black Bull Bar (51011) by Smittybilt. Add protection and rugged styling to the front of your rig with this easy to install Bull Bar. Crafted from thick 3" tubular steel, it includes a heavy-duty skid plate and it's drilled for off-road lights up to 5". The Bull Bar is available in your choice of carbon steel with dual stage high-gloss black powdercoated finish or highly polished 304 marine-grade stainless steel. 2000-2006 Chevrolet Tahoe Bull Bar - Black Smittybilt (51011). Black Bull Bar (51011) by Smittybilt. Add protection and rugged styling to the front of your rig with this easy to install Bull Bar. Crafted from thick 3" tubular steel, it includes a heavy-duty skid plate and it's drilled for off-road lights up to 5". The Bull Bar is available in your choice of carbon steel with dual stage high-gloss black powdercoated finish or highly polished 304 marine-grade stainless steel. 2000-2006 GMC Yukon Bull Bar - Black Smittybilt (51011). Black Bull Bar (51011) by Smittybilt. Add protection and rugged styling to the front of your rig with this easy to install Bull Bar. Crafted from thick 3" tubular steel, it includes a heavy-duty skid plate and it's drilled for off-road lights up to 5". The Bull Bar is available in your choice of carbon steel with dual stage high-gloss black powdercoated finish or highly polished 304 marine-grade stainless steel. 1999-2006 Chevrolet Silverado 1500 Bull Bar - Stainless Steel Smittybilt (51012). Polished Bull Bar (51012) by Smittybilt. Add protection and rugged styling to the front of your rig with this easy to install Bull Bar. Crafted from thick 3" tubular steel, it includes a heavy-duty skid plate and it's drilled for off-road lights up to 5". The Bull Bar is available in your choice of carbon steel with dual stage high-gloss black powdercoated finish or highly polished 304 marine-grade stainless steel. 1999-2006 GMC Sierra 1500 Bull Bar - Stainless Steel Smittybilt (51012). Polished Bull Bar (51012) by Smittybilt. Add protection and rugged styling to the front of your rig with this easy to install Bull Bar. Crafted from thick 3" tubular steel, it includes a heavy-duty skid plate and it's drilled for off-road lights up to 5". The Bull Bar is available in your choice of carbon steel with dual stage high-gloss black powdercoated finish or highly polished 304 marine-grade stainless steel. 2002-2006 Chevrolet Avalanche Bull Bar - Stainless Steel Smittybilt (51012). Polished Bull Bar (51012) by Smittybilt. Add protection and rugged styling to the front of your rig with this easy to install Bull Bar. Crafted from thick 3" tubular steel, it includes a heavy-duty skid plate and it's drilled for off-road lights up to 5". The Bull Bar is available in your choice of carbon steel with dual stage high-gloss black powdercoated finish or highly polished 304 marine-grade stainless steel. 2002-2006 Chevrolet Suburban 1500 Bull Bar - Stainless Steel Smittybilt (51012). Polished Bull Bar (51012) by Smittybilt. Add protection and rugged styling to the front of your rig with this easy to install Bull Bar. Crafted from thick 3" tubular steel, it includes a heavy-duty skid plate and it's drilled for off-road lights up to 5". The Bull Bar is available in your choice of carbon steel with dual stage high-gloss black powdercoated finish or highly polished 304 marine-grade stainless steel. 2002-2006 GMC Yukon XL Bull Bar - Stainless Steel Smittybilt (51012). Polished Bull Bar (51012) by Smittybilt. Add protection and rugged styling to the front of your rig with this easy to install Bull Bar. Crafted from thick 3" tubular steel, it includes a heavy-duty skid plate and it's drilled for off-road lights up to 5". The Bull Bar is available in your choice of carbon steel with dual stage high-gloss black powdercoated finish or highly polished 304 marine-grade stainless steel. 2000-2006 Chevrolet Tahoe Bull Bar - Stainless Steel Smittybilt (51012). Polished Bull Bar (51012) by Smittybilt. Add protection and rugged styling to the front of your rig with this easy to install Bull Bar. Crafted from thick 3" tubular steel, it includes a heavy-duty skid plate and it's drilled for off-road lights up to 5". The Bull Bar is available in your choice of carbon steel with dual stage high-gloss black powdercoated finish or highly polished 304 marine-grade stainless steel. 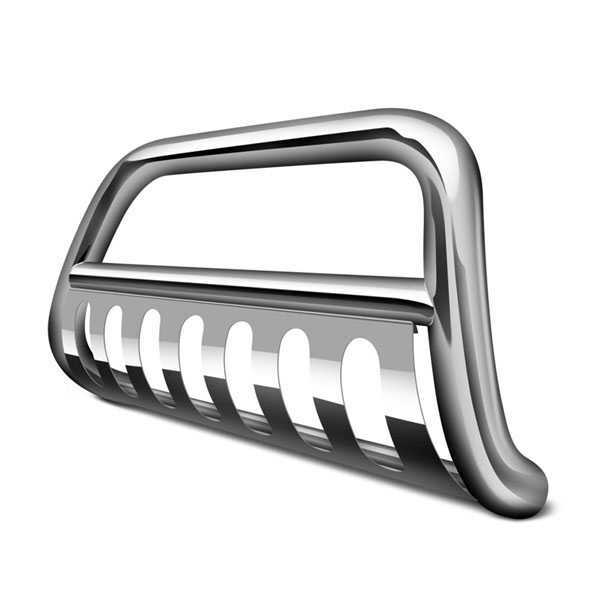 2000-2006 GMC Yukon Bull Bar - Stainless Steel Smittybilt (51012). Polished Bull Bar (51012) by Smittybilt. Add protection and rugged styling to the front of your rig with this easy to install Bull Bar. Crafted from thick 3" tubular steel, it includes a heavy-duty skid plate and it's drilled for off-road lights up to 5". The Bull Bar is available in your choice of carbon steel with dual stage high-gloss black powdercoated finish or highly polished 304 marine-grade stainless steel. 1999-2007 Chevrolet Silverado 1500 Bull Bar - Black Smittybilt (51031). Black Bull Bar (51031) by Smittybilt. Add protection and rugged styling to the front of your rig with this easy to install Bull Bar. Crafted from thick 3" tubular steel, it includes a heavy-duty skid plate and it's drilled for off-road lights up to 5". The Bull Bar is available in your choice of carbon steel with dual stage high-gloss black powdercoated finish or highly polished 304 marine-grade stainless steel. 1999-2007 Chevrolet Silverado 2500HD Bull Bar - Black Smittybilt (51031). Black Bull Bar (51031) by Smittybilt. Add protection and rugged styling to the front of your rig with this easy to install Bull Bar. Crafted from thick 3" tubular steel, it includes a heavy-duty skid plate and it's drilled for off-road lights up to 5". The Bull Bar is available in your choice of carbon steel with dual stage high-gloss black powdercoated finish or highly polished 304 marine-grade stainless steel. 1999-2007 Chevrolet Silverado 3500HD Bull Bar - Black Smittybilt (51031). Black Bull Bar (51031) by Smittybilt. Add protection and rugged styling to the front of your rig with this easy to install Bull Bar. Crafted from thick 3" tubular steel, it includes a heavy-duty skid plate and it's drilled for off-road lights up to 5". The Bull Bar is available in your choice of carbon steel with dual stage high-gloss black powdercoated finish or highly polished 304 marine-grade stainless steel. 1999-2007 GMC Sierra 1500 Bull Bar - Black Smittybilt (51031). Black Bull Bar (51031) by Smittybilt. Add protection and rugged styling to the front of your rig with this easy to install Bull Bar. Crafted from thick 3" tubular steel, it includes a heavy-duty skid plate and it's drilled for off-road lights up to 5". The Bull Bar is available in your choice of carbon steel with dual stage high-gloss black powdercoated finish or highly polished 304 marine-grade stainless steel. 1999-2007 GMC Sierra 2500HD Bull Bar - Black Smittybilt (51031). Black Bull Bar (51031) by Smittybilt. Add protection and rugged styling to the front of your rig with this easy to install Bull Bar. Crafted from thick 3" tubular steel, it includes a heavy-duty skid plate and it's drilled for off-road lights up to 5". The Bull Bar is available in your choice of carbon steel with dual stage high-gloss black powdercoated finish or highly polished 304 marine-grade stainless steel. 1999-2007 GMC Sierra 3500HD Bull Bar - Black Smittybilt (51031). Black Bull Bar (51031) by Smittybilt. Add protection and rugged styling to the front of your rig with this easy to install Bull Bar. Crafted from thick 3" tubular steel, it includes a heavy-duty skid plate and it's drilled for off-road lights up to 5". The Bull Bar is available in your choice of carbon steel with dual stage high-gloss black powdercoated finish or highly polished 304 marine-grade stainless steel.